Politik Indonesia: Indonesian Political Science Review is political science's premier scholarly research journal on Indonesian politics, providing peer-reviewed articles and review essays from subfields throughout the discipline. Areas covered: local politics, ethics and politics, public policy, and others. 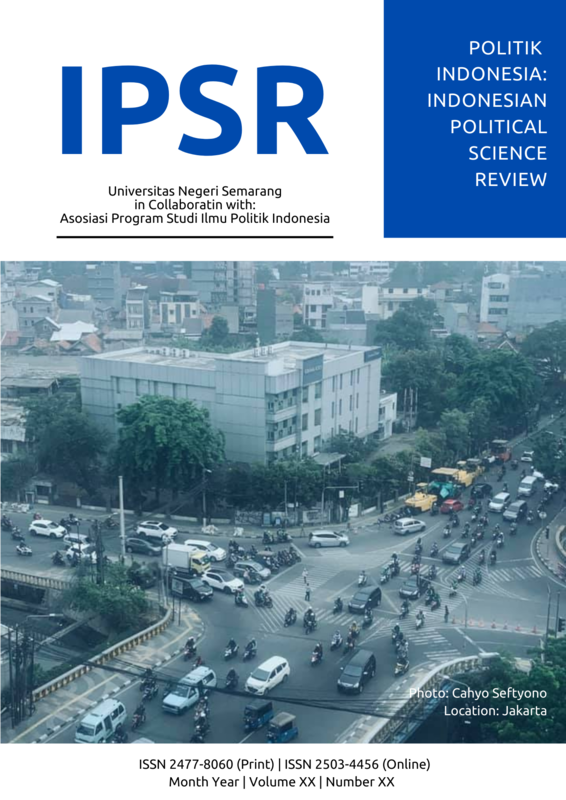 Politik Indonesia: Indonesian Political Science Review has published continuously since 2016 with registered number ISSN 2477-8060 (print), ISSN 2503-4456 (online). Published by Political Science Program, Universitas Negeri Semarang in cooperation with The Indonesian Inter-University Association for Political Science (APSIPOL). Politik Indonesia: Indonesian Political Science Review is an open access journal and also available in print. Politik Indonesia: Indonesian Political Science Review has been accredited by Indonesia Ministry of Research, Technology and Higher Education (No. 51/E/KPT/2017 December 4, 2017) period: 2017-2022.